As you know, I just love spotting Easter Eggs when I’m watching movies, and Zootropolis is chock-full of lots of fun Disney and other pop culture references. So, I’ve collected all the easter eggs and references I could spot in my latest video. 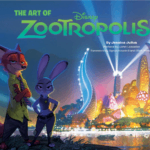 And on top of all those lovely easter eggs, I’ve also got an awesome giveaway thanks to our friends at Chronicle Books, so if you’d like the chance to win the gorgeous hardback book The Art of Zootropolis, check out my video to find out how! Zootropolis hits UK cinemas on 25 March and is in US cinemas now. 3 Comments for "Zootropolis Easter Eggs, References & Inside Jokes"
Me and my son spotted Lilo and Stiches beach buggy that Judy put a parking ticket on. Also ‘The Big Donut’ is a name of a shop on Steven Universe!